The XMan Cometh to Your Town This Xmas. Thank you for downloading Xmas Vibe by Charles Xavier. Your review consideration is greatly appreciated. Called a "Rara Avis" by the legendary Down Beat Magazine, Vibraphonist Charles Xavier is on tour on the east and west coasts in December, performing tracks from his lauded new CD, Xmas Vibe. Defying convention, Xavier’s Xmas Vibe is captivatingly jazzy, New Age and trance-like with delicate vocals, guitar, piano, vibes, chimes and bells, and sampling and technology. Enchanting, mystical, and abstract, Charles Xavier’s Xmas Vibe takes the listener on a creatively harmonious and melodious musical journey through a magical winter landscape of style and unusual flair. Enjoy and Happy Holidays to you and yours. 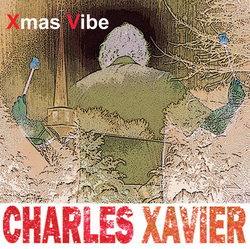 Please Submit Your Contact Information Below to Download a Copy of Charles Xavier's New Album Xmas Vibe. After clicking SUBMIT please enter the password... xavier.